CARBONDALE, Ill. — Everyone is welcome at the big book sale planned at Southern Illinois University Carbondale’s Morris Library on April 12 and 13. 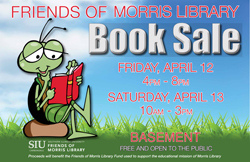 The Friends of Morris Library are sponsoring the sale from 4 to 8 p.m. on April 12 and 10 a.m. to 3 p.m. on April 13 in the lower level of the library. Admission is free both days. Sale proceeds are used to purchase materials and support the library’s mission. For those wanting to donate books for the sale, drop boxes can be found at several locations in the Carbondale area, including Ace Hardware, the Furniture King and SIU Credit Union locations. Organizers ask that the new or gently used books not be moldy or otherwise damaged. Textbooks and outdated technology books will also not be accepted. For more information about the book sale, contact Morris Library at 618/453-2522.